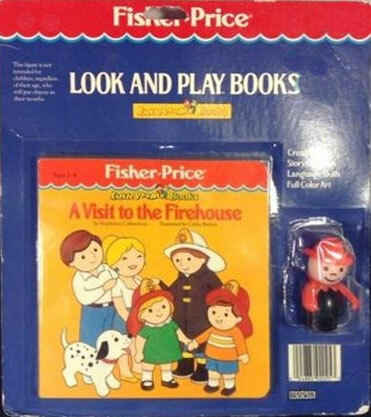 Description: Several licenced Fisher-Price books were made featuring Little People Characters. "A Visit To The Firehouse" is a square hard cover Look-and-Play book with 12 cardboard pages with brightly colored Little People characters. Designed for children ages 2 to 4 years old. FPT5186 - Small square hard cover book with 12 cardboard pages titled "A Visit To The Firehouse". The cover is orange with a picture of a Little People family standing with a fireman and Dalmation dog. The Little People boy and girl are wearing fireman helmets. ©1986. Measures 5-1/8" square. FPT45300 - Mint on card set.